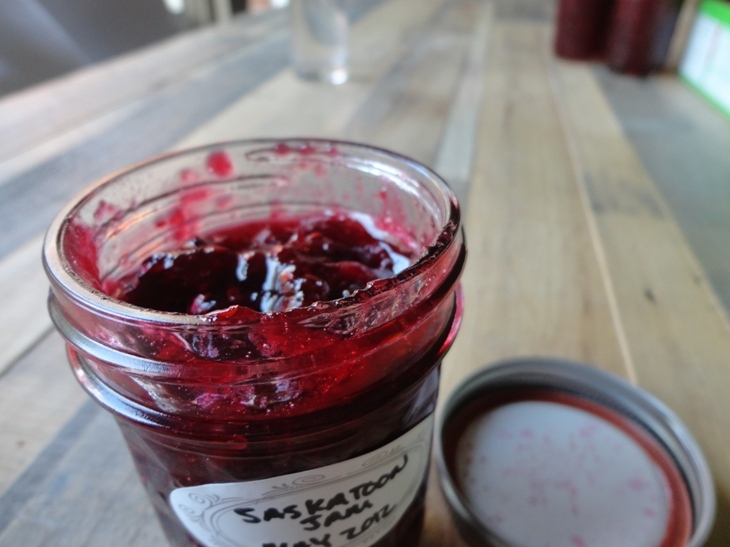 Okay, okay, it’s jam season and you’re probably sick of hearing about it already with all of the strawberry jam posts. I’ll be brief on this one. When we first bought our house, we had no idea what a gem we had in the courtyard patio. It wasn’t until a dear friend was over for dinner that we learned what a Saskatoon was. 4 cups of multicolored beauties from the tree in our tiny courtyard. 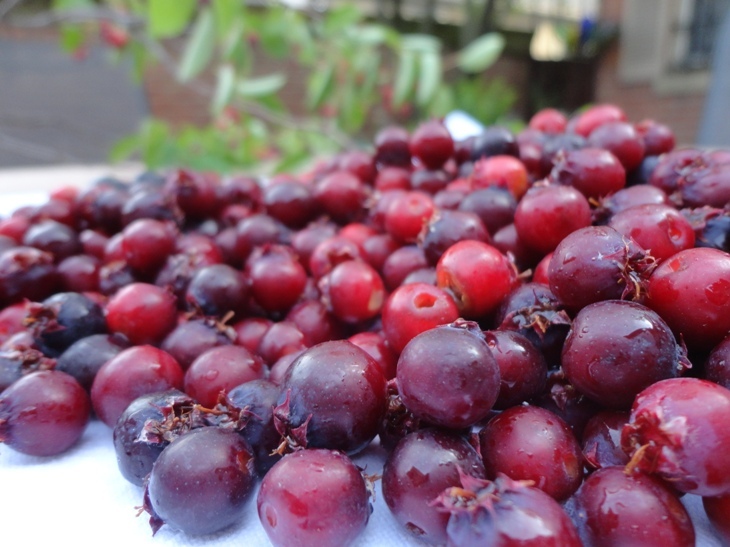 Also called Juneberries or serviceberries–or any other name that Faith Durand has identified in her post about them–these are sweet, little bundles of berry love. 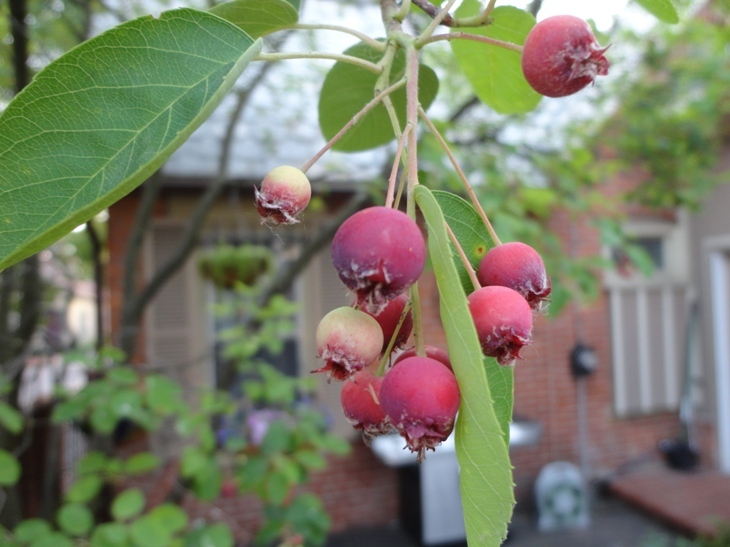 Lots of public places, front yards and tree lawns seem to have these trees and I rarely see the berries harvested. So, if you’re on a walk and see a tree that looks like the picture below, go get a bowl, knock on the door of the yard they’re in, make a friend and get harvesting. I can pretty much guarantee one of your neighbors has one of these trees. Though they look and even smell a good bit like blueberries, they’re more botanically related to apples and with that comes a lot of pectin. This means you don’t need to add much–if any at all–when making jam out of them. Just mash, add acid, cook very briefly, add sugar, boil a bit and jar ’em up. This year’s crop was unbelievably sweet and despite adding more lemon juice after the sugar addition I fear it’s still too sweet. Next time, maybe I’ll start with just 1/2 the sugar or even add some lemon zest. Alas, it’s homemade, reminds me of late spring and came from our back yard so I love it anyway. I almost can’t wait to experience this jam on a winter-time pancake. We’ll see if it lasts that long.